UK, 1972, 87 minutes, Colour. Martin Potter, Julia Foster, Nicky Henson, Ian Hendry. 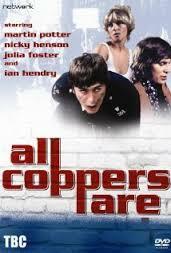 All Coppers Are ... (it seems, bastards). This is a British police drama, similar to many on television. In fact, Allan Prior, the screenplay writer, wrote many episodes for Z Cars and Softly Softly. The film is enjoyable enough in itself, nothing startling, simply an extended episode. Direction is by Sidney Hayers who directed a number of cinema thrillers in the '70s based on experience of much television directing, including The Avengers. 1. An entertaining police thriller? The continued popularity of the police thriller' A glimpse of the British police force at work. '(strengths and weaknesses)? 2. The atmosphere of London? The streets, gangsters and petty crooks, homes? A sardonic look at London? Authentic location photography? 3. The title and the attitudes towards the police? By criminals? By the public? The police view of themselves? 4. The focus on Joe, his work as a London police constable, his age and experience? The wedding reception? The encounter with Barry? The meeting with Sue? His affair with Sue? The background of his own home life, Peg, their daughter? The second encounter with Sue and Barry? Their reaction to him as a policeman? His marriage? His work on the beat? Routine police work? The hazards of his life? His encounter with Barry, the robbery, the factory gates, his investigating, shooting, his dragging himself to ring the alarm bell? Picture of a young man and his potential? 5. Barry as a small-time crook, his relationship with Sue, the meeting with Joe? Barry and Sue against Joe? Barry and his crime work, the cigarette haul, the deals with Sonny Wade? His hopes for taking Sue away? The plan, the execution, the factory, the lorry, his panic with Joe's presence, shooting him? Picture of a petty crook? 5. Sue and her living with her boyfriend, her relationship with Jock? Her relationship with her mother? The friendship with Joe, the afternoon? Discovering he was a policeman? Friendship with Barry? Affair? Planning to go away with him? Her driving the getaway car? An ordinary London girl caught up in this world? 6. Sonny Wade and his criminal connections, work as a fence, homosexual? contacts? Working with Barry? 7. Sue's mother, her attitudes towards life, rough? Jock and Sue's relationship with him? The neighbourhood? Types? 8. Peg and her daughter? Relationship with Joe? 9. The background of London, police stations, petty criminals, robberies? 10. The popular material of police series?